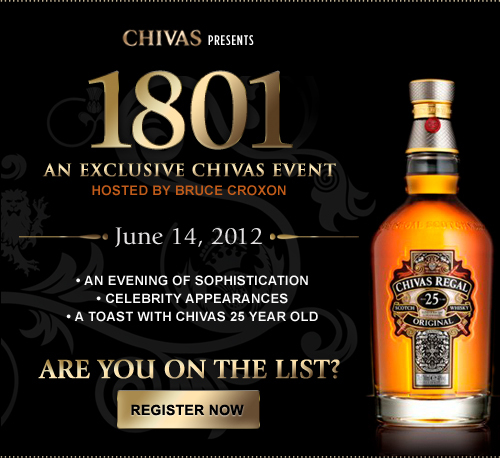 Chivas is declaring June 14th to be the scotch event of the year. Be sure to mark your calendars and register to “get past the velvet rope”. Check the website for other Chivas events. The next Chivas event “Sip, Shower, & Shave” is May 1st at Mankind at 221 Eglinton Ave. 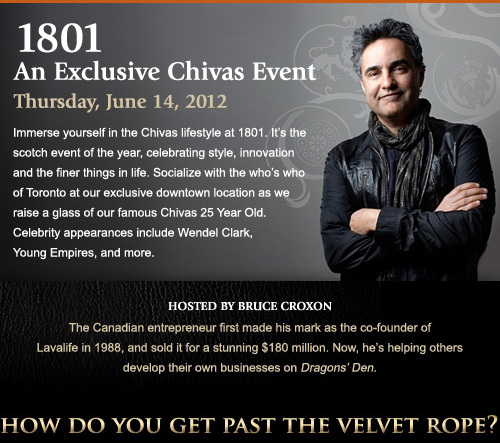 Hosted by Bruce Croxon (the co-founder of Lavalife) on June 14, 2012, you can have a chance to immerse yourself in the Chivas lifestyle at 1801. It’s the scotch event of the year, celebrating style, innovation and the finer things in life. Socialize with the who’s who of Toronto at our exclusive downtown location as we raise a glass of our famous Chivas 25 Year Old. Celebrity appearances include Wendel Clark, The Young Empires, and more.